Founded in 1977, Hitchin Historical Society is a registered charity whose object is to increase and spread knowledge of all aspects of the history of Hitchin. We also liaise with other local societies on issues where we feel that account should be taken of the town’s historic character. Society talks are held on the fourth Thursday of each month (except June, July, August and December) at 8 pm in Church House, Churchyard, Hitchin. At each talk, a guest speaker talks, usually with illustrations, on an aspect of local history. The atmosphere is relaxed and friendly; coffee and biscuits are available, and you will be made warmly welcome. The meetings are held in Church House, a building dating from about 1970 in Churchyard, on the north side of the church. It is conveniently located for car parking in Portmill Lane or St Mary’s Square. The building was designed by W S Hattrell and Partners and on the front is a mural by Anthony Holloway, which Sir Nikolaus Pevsner thought might be symbolic of the destruction of the past by modern machinery. Each year we arrange visits to local buildings and institutions, many of which are not normally open to the general public. We also organise trips, at reasonable charges to cover costs, to places of historical interest further afield. Members receive a regular newsletter, keeping them abreast of Society news and events in the town, and a periodic magazine, the Hitchin Journal. The Journal carries articles on Hitchin’s history, as well as members’ reminiscences and research, and covers the impact of current events on the town’s heritage. On the practical side, the Society has an active publications programme. We produce high-quality publications on the history of the town, its buildings and people. Recent, well received, examples are Cold Baths Don’t Work, A Royal Day to Remember (DVD), Maydencroft Manor and Carriages to Cars, as well as the ever-popular Fire! Fire! Fireman Fisher’s Hitchin Diary and Old Hitchin on Film (DVD vol 2). New publications are constantly in the pipeline. Members may borrow from the Society’s extensive collection of books and other historical material. Membership is open to everyone; all you need to bring is an interest in Hitchin and its history. 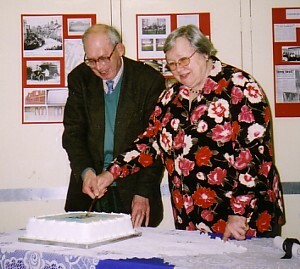 At our 30th Anniversary celebrations in 2007, we held several special events during the Annual General Meeting including presentations by members past and present, with memories and stories of the Society over the years.